You take a tire and fill it with dirt, then plant as many potatoes as allowed for the space. When the vines grow to roughly 3 feet, then you lift the vines and pull them up thru another tire, fill with dirt around the vine, and so on and so on until you have 4 tires on top of each other filled with dirt. Shoots will take off in each tire from the vine from the base tire. During the summer months you have a beautiful cascading vine and when it dies back, you simply pull the potatoes. Backwoods Home Magazine also mentions using old tires. Since we are fairly limited on garden space I am always looking for a way to grow things vertically. This tire method seemed to fit the bill. The procedure is fairly simple. The idea here is that potatoes will keep growing inside each tire as you add one to the stack. I’m not sure how high you can stack them but I am going to try to go to four tires high. Now, does anyone know where I can buy potato seeds? 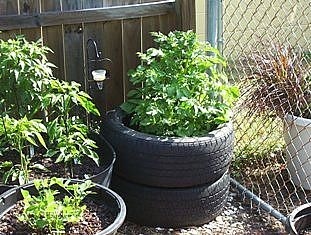 This entry was posted in Gardening and tagged growing spuds in tires, reclycing old tires by Emily Jones. Bookmark the permalink. Another reader shared her use of Kiddy pools recycled and raised bed gardening. Cute and quick idea. Actually, you are looking for seed potatoes- you plant the eyes!